Scooby Dooby Doo! My name is Scooby and if you think I’m handsome in these pictures wait until you meet me in person. I’m a one year old, 24 lb. 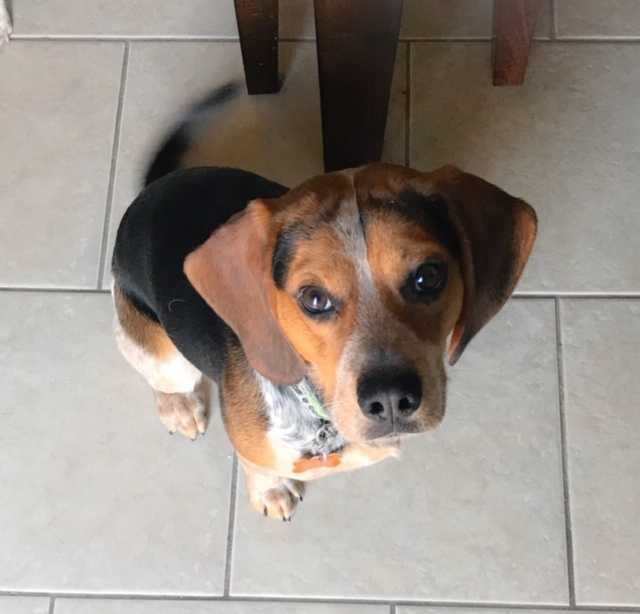 male beagle and I’ve got a secret to tell you, I’m ready to be your best buddy, get ready for excitement, cuddles and kisses! Not only am I a soft snuggle bug, I’m also very energetic and curious. I can’t wait to be with my new family so we can have adventures together like going on walks. I’m actually quite talented (paw tapping shoulder), I’d really do well with agility training if that sounds like fun to you. I love to jump, leap and run. Because of my talents I will need a wooden 6 foot fenced yard. I can scale a 4 ft chain link! So for safety reasons a tall one is required! I’m interested in everything so you may need to help guide me to know when I’m being a bit nosey. I love people, children and other dogs (let’s wrestle!). I’ve never met a cat so I’m not sure about those little furry friends. I’m gentle but energetic, a puppy heart with enough training to know commands like, come, sit, go. I’m also potty trained, that’s right folks, I know to go potty outside. I’ve been learning to use a bell and go to the back sliding door, but I can also let you know I’m ready by coming to you and prancing around. If you would like a furry friend who wants to be active but also can cuddle with the best of them, I’m your guy!